Law firms and lawyers are deeply rooted in Canada’s only officially bilingual province. There are 15 counties in New Brunswick that span roughly 73,000 square kilometres and are home to approximately 747,000 people. The dimensions and the demographics, however, belie another numerical reality. At its heart, Canada’s eighth smallest and eighth most populous province comprises four distinct centres. There are the three main cities — Saint John (not St. John’s, please), Fredericton and Moncton — that jostle for prominence, status and market share. Then there is northern New Brunswick. This is Acadian country, and French-speaking communities predominate, closer in many ways to the Quebec border the region shares than to the rest of New Brunswick. Across the province, towns and villages, as opposed to cities, dominate the landscape. Interactions between lawyers shift with the geography as do legal processes and approaches. For example, notes Chiasson, there are differences between clerks’ offices. Acknowledging and respecting those subtleties is second nature to lawyers who have been practising in the province for even a short time. That is linked in large part to the smaller size of the province. “As a result, the bar is more intimate,” says George Cooper, managing partner with Cox & Palmer in Moncton. Indeed, collegiality defines the bar in New Brunswick perhaps more deeply and broadly than in other jurisdictions. “You always have your battles and your disputes, but for the most part, there is a high respect for each other,” says Chiasson, whose practice focuses on commercial, construction and insurance litigation. There are two other significant elements to the practice of law here that further distinguish the legal community from many others across Canada. As Canada’s only bilingual province, New Brunswick has a legal as well as a cultural commitment to conducting life and business in both official languages. Slightly more than one-third of the province’s population is bilingual, the highest rate after Quebec. The work/life balance is also different for lawyers in New Brunswick than in many other centres across Canada. Here there is a belief that life outside the office is as valuable as what happens at one’s desk, and that belief receives more than lip service. “There are some days around here that it is not much different from Toronto — working long hours with lawyers across the country,” says Stewart. What it means to be sitting at your desk also takes on a whole new meaning in New Brunswick. From his office in downtown Moncton, Stewart, a sailor, is only 40 minutes from the Bay of Fundy, home to the world’s highest tides and one of the Seven Wonders of North America. He’s 25 minutes from the Northumberland Strait and Confederation Bridge, which links P.E.I. to the rest of Canada. The U.S. border is only a few hours away. “That allows you access to all kinds of things. . . . It’s the best of both worlds,” says Stewart. 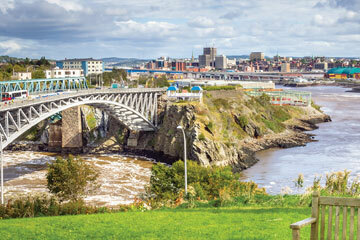 Economically, New Brunswick is struggling. Home to the first incorporated city in Canada and one of the first universities on the continent, the province was once prosperous in large part due to logging and shipbuilding activities. That was, in some cases, at least a century ago, however. Today, the province is grappling with an aging population, one of the fastest growing in the country, and massive debt. According to the government’s 2017-18 budget, the debt will hit $14.4 billion by the end of the fiscal year, roughly $1 billion more than forecast only a year earlier. Firms in New Brunswick, particularly the larger firms, also have a unique perspective on business development — and on the nature of the work they do. McInnes Cooper, Stewart McKelvey and Cox & Palmer have been called (and have been known to call themselves) “regional firms,” a moniker that reflects the reality of doing business in Atlantic Canada. Unlike large Canadian firms that label themselves “national” yet have no presence east of Quebec, regional firms have a presence, often deeply rooted, across the East Coast. It may be the affable nature of legal practice in New Brunswick or the best-of-both-worlds lifestyle, but lawyers in the province are often here for the long term. “ Lots of us are still lifers. Being with a firm becomes part of who you are,” says Stewart. The University of New Brunswick law grad has some advice for lawyers looking to practise in Canada’s picture province: Consider both your professional life and your personal life. “They will be intertwined,” Stewart cautions. *All stats but one from the Law Society of NB.